Mitel & IP Phone Systems in Rochester, Buffalo, Syracuse NY | Rel Comm Inc.
Mitel is a global leader in the telecommunications industry. With over 40 years of experience, Mitel has been at the forefront of today’s technological advances. They are a leader in the Gartners Magic Quadrant. As technology advances, Mitel’s research and development team integrates and develops the applications that create the efficiencies in the workplace that make a difference. Mitel has VOIP solutions that can be tailored to your needs. From the SMB customer to the enterprise company, Mitel has a solution that will fit your needs today and scale for the future. Businesses can take advantage of deploying their voice communications in the cloud, in a virtual environment, on an industry standard server or as an appliance. Mitel gives you the freedom to deploy telephony and business applications, your way. Mitel offers collaboration applications, contact center solutions, mobility solutions as well as Unified communications & messaging, voice documentation and reporting applications. The MiVoice Business unified communications platform is built for the Enterprise customer in mind. The platform can be deployed as an appliance, on a virtual machine or on an industry standard server. This platform offers redundancy as well as resiliency for your IP phones. Distributed, centralized, and public cloud – you can choose your deployment strategy. In addition, virtual deployment allows you to take advantage of the business continuity services available through VMware. An administrator can administer a multi-platform MiVoice Business solution from their web browser as if it was a single platform solution. System changes are automatically synchronized across the solution, and management control and tasks can be delegated across the organization, rather than relying on a centralized point. MiVoice Business operates across any LAN / WAN infrastructure, coupled with embedded native support for standards-based networking such as SIP, Q.SIG, and DPNSS, offering businesses the ability to protect existing investments irrespective of legacy PBX, while delivering all the advantages of a converged infrastructure. MiVoice Office 250 ensures small and medium sized businesses are more flexible and responsive. Through a complete suite of out-of-the-box business productivity applications, your business will benefit from reduced costs and enhanced staff productivity. MiVoice Office 250 delivers as standard applications: Unified Voice Messaging with Automated Attendant, Meet-Me Conferencing, Automatic Call Distribution, Hot Desking, Twinning, Mobile Hand-Off, Teleworking and Reporting. Effective collaboration among employees, partners and customers is a critical driver of any organization’s success. It’s only by building productive relationships that information and ideas get shared, better products get to market faster, suppliers and partners work seamlessly together to achieve shared goals, and lasting and profitable relationships are built with customers. However, in today’s fast-paced global marketplace, with rapidly evolving manners of working, ensuring that kind of collaboration can be more challenging than ever. To simplify this for you, Mitel offers a single, comprehensive collaboration solution: Mitel MiCollab. As a component of Mitel’s Unified Communications and Collaboration (UCC) solution, MiCollab makes it easy for employees to manage all aspects of their day-to-day interactions, no matter where they are or how they choose to be productive – it provides people with all the communication tools they need, when they need it. By integrating collaboration, mobility, and messaging tools into a single, unified solution with a highly intuitive interface, people spend less time trying to connect and more time engaged in productive and innovative interactions. For organizations large and small, MiCollab delivers the kind of cost-effective UCC capabilities needed to assist with increasing business productivity, building a competitive advantage, and driving business success. Mitel MiCollab’s integrated suite of applications includes MiCollab client and MiContact. Mitel’s Unified Communications solution that provides users with a single access point for all their business communication and collaboration needs, MiCollab Client enables real-time access to collaboration capabilities by everyone in your organization, regardless of location or device. This comprehensive conferencing solution provides your business with audio, web and video conferencing services that provide large scale audio conferencing, rich web interactions, and helps improve collaboration and information sharing among employees and with customers, partners, and suppliers. Unified messaging enables people to manage voice mail, email and fax messages from their personal phones and devices. From basic voice mail to advanced unified messaging, a full-featured and flexible unified messaging solution with a low total cost of ownership satisfies the diverse needs of your entire organization. Mitel’s Teleworking solutions allow employees “plug and work” access to the corporate voice network from home or on the road, seamlessly retaining all of the communications features and functionality enjoyed at the office. MiContact Center solutions improve employee productivity and control operational costs within businesses of all sizes. Through reporting metrics any formal or informal customer service center can gauge their customer satisfaction. These reporting metrics also help with workflow management and help management forecasting their staffing needs. This Contact Center software integrates to the MiVoice Business platform only. Mitel 5304 IP Phone is a cost-effective entry-level display phone that provides access to the features and applications enabled by Mitel’s IP-based communications platforms. It is a dual-mode, dual-port, two-line phone with a 40-character backlit display. Mitel 5312 IP Phone is a dual-port, dual-mode, enterprise-class IP phone with full-duplex speakerphone, a 40-character backlit display and user-programmable access to features and applications. Mitel 5324 IP Phone is a dual-mode, dual-port enterprise-class IP phone with a multi-line display that provides users fast and easy access to the features and applications enabled by Mitel’s IP communications platforms. The Mitel 5324 IP Phone is designed for power users, such as teleworkers, remote workers, and ACD agents or supervisors, who require an expanded range of programmable features. The Mitel 5320e IP Phone is an economical, entry level, self-labeling, backlit enterprise phone that is specifically designed for communications-intensive companies that require a converged IP infrastructure to deliver productivity and customer-enhancing applications and services to the user desktop. The 5320e IP Phone demonstrates Mitel’s commitment to ease of use and enhanced user value, Administrators will appreciate the ability to easily manage users through remote programming, eliminating the need for any paper labels, and thereby reducing installation and ongoing operational costs. The 5320e has a 10/100/1000 throughput switch for GB converged networks. The Mitel 5330e IP Phone is a next-generation, full-feature enterprise class phone that provides users with a large graphics display, Dual Mode Protocol SIP / MiNet, Wideband Audio support, HTML Applications Toolkit built in, and 24 programmable self-labelling keys that provide one-touch access to speed calls, and much more. This phone is backlit and provides 10/100/1000 throughput on converged IP networks. 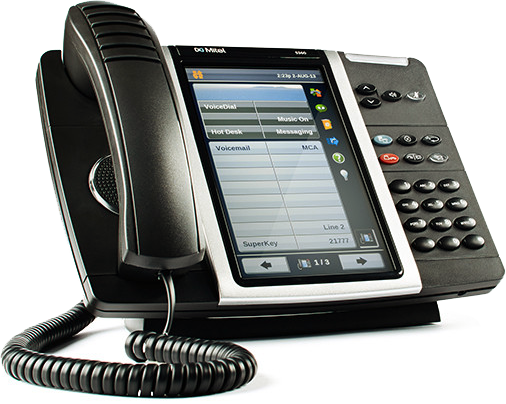 The Mitel 5340 IP Phone is a new generation phone that can be customized to a specific user and includes a large (backlit) graphics display, Dual Mode Protocol SIP / MiNet, Wideband Audio support, HTML Applications Toolkit built in, and 48 programmable self-labelling keys that provide one-touch access to speed calls, and much more. This phone provides 10/100/1000 throughput for converged IP networks. The Mitel 5360 IP Phone is an exciting next generation desktop device that provides a color touch display to graphically deliver rich applications to general business or across multiple vertical market sectors. Equipped with a Gadget Sidebar (patent pending), the seven-inch display enables one-touch access to embedded or internet-based content and applications. The 5360 IP Phone is ideal for any enterprise executive or manager, teleworker, and contact center supervisor. The MiVoice 8568 Telephone is perfect for users requiring efficient call processing capabilities from the Mitel MiVoice Office Platform. This powerful, ergonomically designed digital telephone features a six-line by 16-character display with eight menu-driven soft keys, which intuitively guide users through system features and capabilities. Sixteen programmable multi-function keys and 10 fixed function keys can be customized for one-touch access to the most commonly used telephony functions and settings. A built-in jack allows headsets to be attached to the phone without interfering with handset operation. The MiVoice 8568 Telephone supports both the Mitel Programmable Key Module (PKM) 12 and the Mitel Programmable Key Module (PKM) 48 for additional programmable keys and DSS/BLF functionality. Support for the Mitel Unified Communicator Express and Mitel MiCollab Client make the Mitel 8568 a powerful communications tool for small and medium businesses. The MiVoice 6900 series is a family of powerful ‘Mobile First’ IP phones offering advanced integration with mobile phone calls and applications. Mitel’s MobileLink capability enables the user’s mobile phone to pair directly with the 6900’s Bluetooth interface to deliver access to mobile phone features from the desk phone allowing both cellphone and IP calls to be managed from a single device. MobileLink allows mobile phone users to leverage the exceptional HD audio and comfortable ergonomics of the 6900 series phones for both IP and cellphone calls. The 6900 phones deliver crystal clear audio through a unique corded or cordless voice optimized handset and high performance hands-free speakerphone. Unparalleled flexibility is achieved through a broad array of add-on user installable accessories that enable the phones to be tailored to specific user needs. The 6900 family provides the flexibility and capability needed to meet the demanding needs of today’s users. The Mitel Bluetooth Module offers unprecedented convenience and corridor mobility for Mitel MiVoice 5330e, 5340e and 5360 IP Phone users. You can pair a third-party Bluetooth headset to allow the user personal area mobility with a potential range of up to 10 meters (30 feet) within their office or adjacent offices – while still communicating on their deskphone. Using a single headset with both a deskphone and cell phone offers a seamless solution for users of Mitel’s Dynamic Extension capability. No more missed calls when you step away from your desk for a few minutes! The 12- and 48-button Mitel Programmable Key Modules (PKMs) extend the capabilities of the Mitel MiVoice 5324, 5330, and 5340 IP Phones and the Mitel MiVoice 8528 and 8568 Telephones with additional buttons and LED indicators. With these expansion modules, you can easily add 12 or 48 or up to 96 buttons to the existing programmable keys on the IP or digital phones. The PKM Interface Module allows the PKM 12 or 48 to be easily connected to an IP or digital phone. This module integrates into the Mitel MiVoice 5324, 5330, 5340 and 5360 IP Phone. The Mitel Line Interface Module is a discrete optional module that integrates into the Mitel MiVoice 5324, 5330, 5340, or 5360 IP Phones and provides a separate connection to an analog line. MiContact Center Office Edition, designed for the MiVoice Office 250 (formerly MiVoice Office) platform, is an entry-level solution for contact centers or workgroups with up to 100 agents. MiContact Center Office Edition enables you to efficiently monitor, manage, and route calls, with real-time business intelligence, including call performance and agent activity reporting, and also delivers agent productivity tools, including screen pop and Personal Information Manager (PIM) integration. Media Blending is a flexible approach to contact and availability, allowing you to route media such as email, fax, and SMS text (using appropriate gateways) as email to agents, in the same manner as voice calls. Connection Assistant – allows agents and supervisors to control their telephone extension from their computer and monitor the call status of their colleagues. Automated dialing, enhanced call control, and screen pops through integration with Microsoft Outlook, ACT! by Sage, Telemagic, Maximizer, GoldMine, and Microsoft Access help optimize agent productivity. CallViewer – provides all the features of Connection Assistant and integrates with additional PIM databases. CallViewer also provides enhanced call control with features such as Do Not Disturb (DND) state control. ● Agent alarms against wrap-up, free, not available, etc. ● Auto Reporter extends the functionality of this package with advanced report scheduling and publishing, real-time statistics, and alarms. • Wideband Audio (22kHz) provides a larger audio dynamic range that matches human speech and hearing to provide a cleaner, crisper sound experience. • Beamforming Technology provides smooth, seamless transition between microphones and focuses microphones on the active speaker without needing to boost microphone gain, virtually eliminating background noise / side conversations from impacting the far end audio experience. • Array of 16 microphones embedded around the phone provides 360 sound pickup from up to 12 feet away minimizing the need for external microphones for most meeting room deployments. Speaker designed for enhanced playback clarity and resistance to mobile phone and wireless device interference. • Tight integration with Mitel communications and collaboration solutions, helps maximize your ROI with your Mitel UCC investment. • Embedded applications, such as WebEx and Join.me clients provides quick & easy access to cloud-based collaboration services – including the ability to support tablet driven presentations in the meeting room. • Embedded web browser provides users with access to other cloud-based services, such as Gmail and Exchange Web, for personal contact dialing and chat functions directly via the MiVoice Conference Phone. • Simply deployment to access embedded collaboration capabilities – connect the phone via a HDMI cable to a hi-definition display / projector. • Loaded with high-end solution sound & functionality with the price point of traditional mid-range audio conference phone. For any questions regarding our Mitel products and their telecommunications capabilities, contact us today by calling 1-888-394-6703!